2 Jeremy Tiang, translates plays and novels from Chinese. He is also a playwright and an author. Jeremy Tiang, translates plays and novels from Chinese. He is also a playwright and an author. He won the Golden Point Award for Fiction in 2009 for his story “Trondheim”. 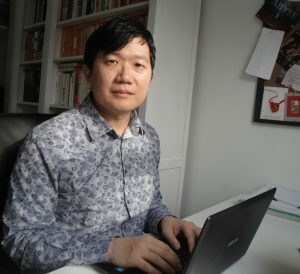 Tiang has translated more than ten books from the Chinese including novels by Chan Ho-Kei, Zhang Yueran, Yeng Pway Ngon and Su Wei-chen and has received an NEA Literary Translation Fellowship, a PEN/Heim Translation Grant, and a People’s Literature Award Mao-Tai Cup. His books It Never Rains on National Day (2015, shortlisted for the 2016 Singapore Literature Prize) and State of Emergency (2017 finalist for the 2016 Epigram Books Fiction Prize) have had excellent reviews. China-Underground: Which authors have influenced you the most? Jeremy Tiang: I’ve taken indiscriminately from so many writers and learnt so much from everything I’ve ever read, that it’s hard to talk about particular influences. Just at the moment, I would say Han Suyin, Yeng Pway Ngon, Viet Thanh Nguyen, Wang Anyi, Tony Kushner. But it’s an ever-shifting list. Translations involve dipping into the author’s thinking. Have you ever found yourself having to do extra or different research from your expectations to complete a translation? Oh, constantly. You have to get right inside an author’s world to translate their work, and the amount of context required is stupendous. I find myself looking up everything from how to make particular types of foods to the specific shades of meaning in a certain dialect swear word. 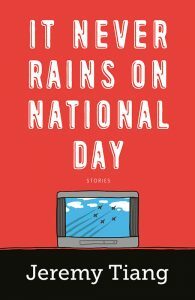 It Never Rains on National Day weaves together a collection of wry, unsettling stories that move on social issues and the diversity of a nation. What are the most important goals in your career? What gave you strength to go on and achieve your goals? My only goal is to do whatever I’m currently doing to the rest of my ability. Right now, my focus is on telling stories that would otherwise go untold. How much of you and your personal life can we find in your novels? It’s all me. Mine is the only life I truly understand inside out, and naturally, I draw from it a lot. How much did traveling affect your stories and the perspective of the characters you want to create? Travelling has made me question things that I considered “normal”, and to understand that there are many, many different ways to live. I hope my characters benefit from this enlarged perspective. Jeremy Tiang, eclectic Singaporean author, is from Chinese and Tamil descent. 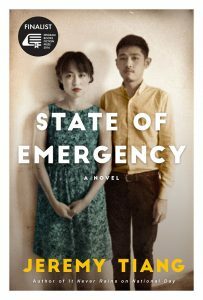 His debut novel, State of Emergency, is focused on a Singaporean family during the decades that followed the Second World War. How much has the Chinese diaspora changed other cultures? How mutually are cultures influencing each other? Do you believe that the dialogue between the Chinese people of the diaspora and the people of the mainland has changed over the years? Mainland China was cut off from the diaspora for quite a long time, due to historical circumstances, and so there’s a certain gulf between the cultures. The current conversation continues to evolve constantly, of course, particularly as China’s influence grows on the world stage. Why did you decide to do a Cultural collision abound Arthur Miller and Ying Ruocheng? Well, why not? For someone who mostly writes about intercultural subjects, the idea of two great theatre icons meeting and collaborating was irresistible. What do you feel to recommend to someone who wants to take the path of translator and writer? What are the main points to consider? Be a good reader, above all else.